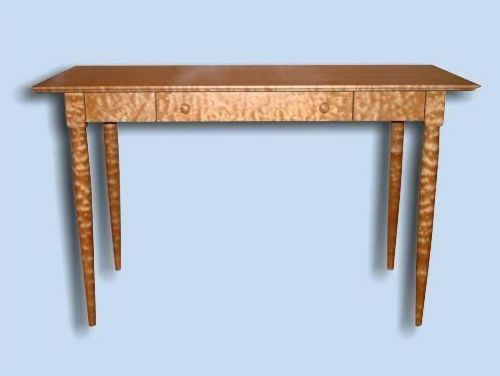 This beautiful Shaker computer desk / side table was completely created out of quilted maple, the most rare wood we work with. This softer cousin of the maples found here in the northeast, this maple tree grows only in northern California, Oregon, and Washington State. The extremely gnarly grain is almost impossible to work with, but produces an iridescence that must be seen in person to believe. The quilted patterns appears to look 1/4" deep from the surface, creating an illusion of hills and valleys you might think you can feel as one runs a hand over it. Click on this image of the table's top to enjoy a larger view. This desk was built to order, and was to be used as a computer desk. It featured a wide single drawer, often found in Shaker design. This drawer held a wireless keyboard and mouse. Pull the drawer out, and drop down the face board for a resting place for the hands. The lid opens with special solid brass Mark Cant Flap hinges. 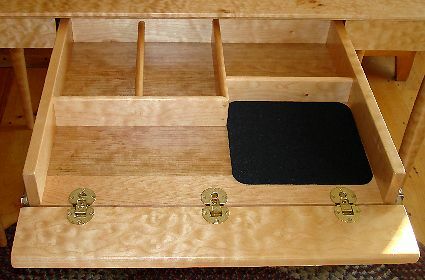 By pulling the drawer completely out, revels some cubbies to store pencils and other supplies. We turn all our legs, posts, pedestals, and knobs completely by hand, with only various chisels to create the shapes. 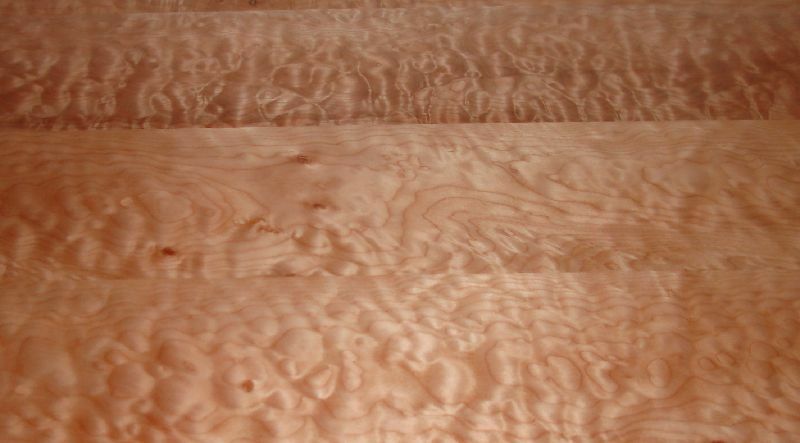 We have no duplicating devise on either of our lathes, a fact that our wood tool salesmen hardly can believe. Quilted maple's grain is so nasty that turning anything out of it is quite the choir. 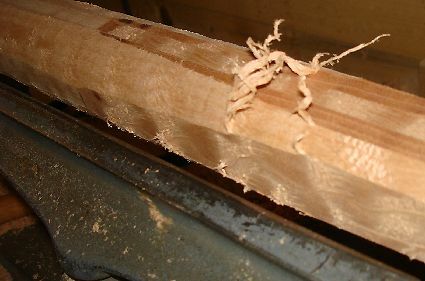 A shot of how the grain rips, and doesn't want to separate from the leg. Woods like cherry actually peel off, almost like you were working with a plastic material. It took us close to 20 extra hours to turn these 4 legs, only because of the type of wood. A shot of the finished legs. 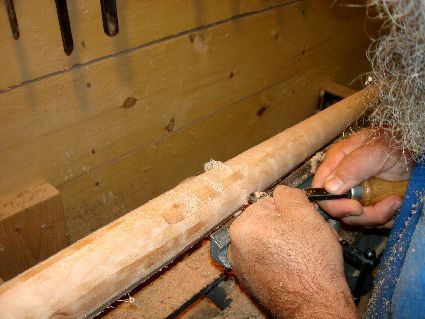 It might sound odd, but it is much harder to turn this simple Shaker arched taper, than a leg that was more ornate. To create a slight arch takes a careful eye to know where to remove the next 1/16" of wood. If you guess wrong, the leg is ruined.